Venue: Sacbe, 77710 Playa del Carmen, Quintana Roo, Mexico. Tickets: Early Bird: USD 165. 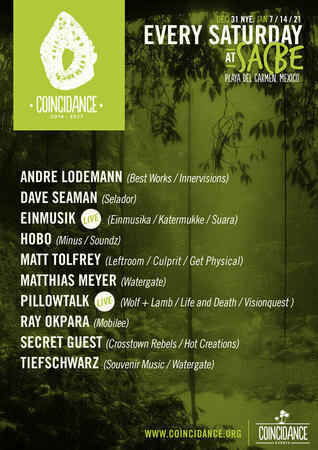 Unique jungle based party Coincidance returns for its third edition in Mexico and brings with it a fresh concept directly from the Ibiza summer season: "Every Saturday in Sacbe". Coincidance is a one of a kind opportunity to party in a fantastic tropical setting. In 2016-2017 the night will offer a weekly mini residency that plays out in the surreal treehouses of the Sacbe jungle in Playa del Carmen. When the season closed down last NYE, the party was named by many as the best party of the year in the Playa del Carmen/Tulum area, so now the series is back with a bang for four consecutive Saturdays in the Jungle, starting December 31 with a massive New year's celebration and memorable opening party then more on January 7th, 14th and 21st for a big closing party. Artists / Speakers: Andre Lodemann, Hobo, Matthias Meyer, Matt Tolfrey, Ray Okpara, Pillowtalk.